Check out this Cactus and Succulents table runner which was machine embroidered with a pattern from Sweet Pea Machine Embroidery Designs. Find a link to get the pattern below. Watch our video to find out more. 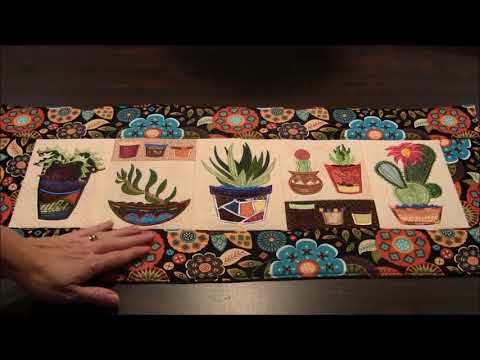 Click to watch the Machine Embroidery - Cactus and Succulents Table Runner video in Youtube. 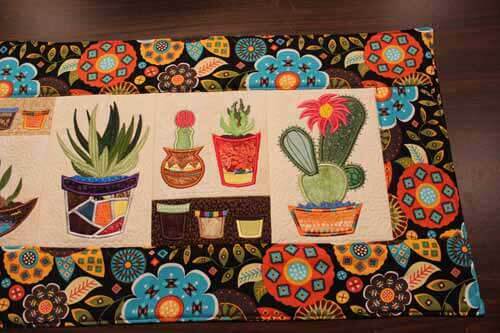 This table runner pattern comes with 6 blocks: 5 cactus/succulents and then one block with the small pots. This table runner is fun to make. You can be creative with the fabrics selected for all of the pots and pot sections. All of Sweet Pea's projects come with a PDF filled with photos and instructions on how to complete the project. So, don't be afraid to try! 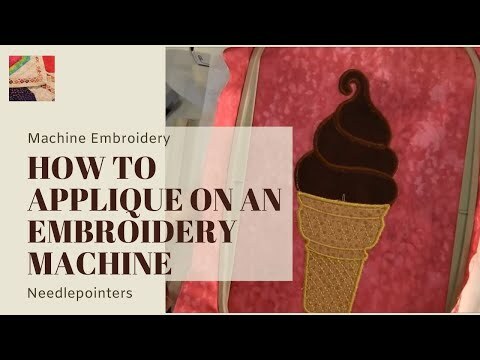 If you have never tried Machine Applique embroidery, check out our video which shows you how. 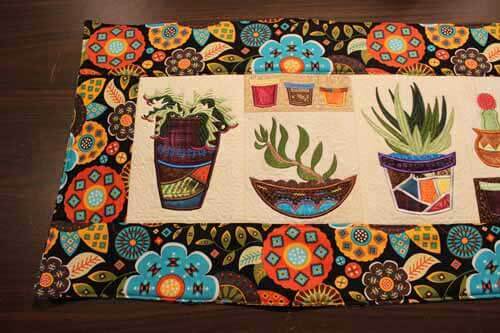 Get the pattern and supplies to make the Cactus and Succulents Table Runner from the links below. Some of the links are affiliate links. Did you enjoy this project? Please share it with your friends using the sharing buttons. Follow our site using the follow buttons below to find out about other fun projects. Supporting Products and links are below. You can support our site by making a purchase from the affiliate links shown below. We make a small commission on sales through the affiliate links, at no extra cost to you. Your purchases help us to keep making more videos and projects like this one. Thank you in advance for your purchase and your support! See info on Affiliate links below. Please be advised that some of the product and other links displayed above may be affiliate links. When you click on links to various merchants on this site and make a purchase, this can result in this site earning a commission. Please see our Affiliate Statement for more information. Please Contact Us if you have any questions. Subscribe To our YouTube channel because we publish New crafting videos On regularly. If you have any questions about this project, you can post them as comments on the Youtube Video above or through our "Contact Us" page. Annette & Chris are a mother/daughter team. We've brought you craft projects and tutorials through this web site for over 20 years. Looking for something you cannot find on our site? Click here to e-mail the Needlepointers Information department.